In a bind? Need access to a certain website, but have no mobile data? Usually, this would be a major issue, but now with a new app called Cosmos Browser, as long as you can send and receive a text message, you can browse the web. Well, let me reiterate – you can browse a very limited version of the web. Before I go on, let me make clear that this app is still in the early stages of development, and your experience might differ than what is expected. If you come across a bug, report it to the developer. 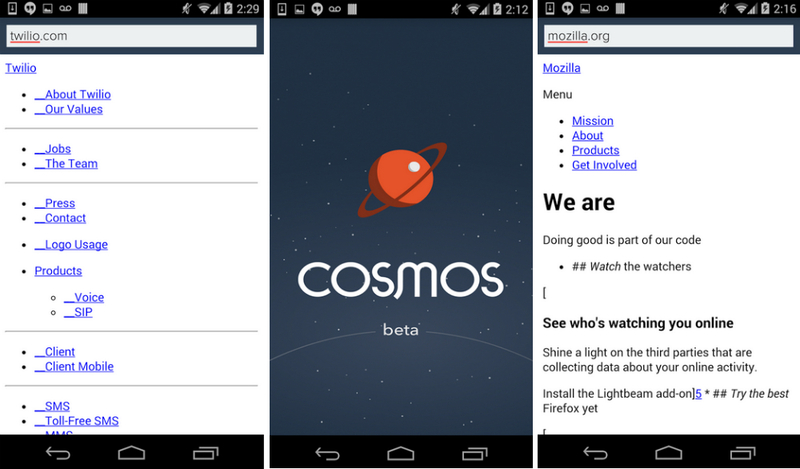 Upon installing Cosmos, users open the application, then type in a valid URL for a website. At that time, a text is sent from your device to a remote server, which packages the website into an openable zip file that is then delivered back to you on your phone via a text message. After that process is complete, the Cosmos intercepts the incoming message, unpackages the website, then displays it for your viewing pleasure. Not that the page looks all that pleasurable when compared to what we are used to seeing, but if for some reason you really need to see a web page, this is an option for you. The app and service is completely free to use, and as stated, it is an early beta. Expect things to break. However, this app is a great proof of concept, and we recommend you check it out, if not to just bug test it for the developer.